to align the related rules with international practices so as to protect the integrity of the tax base. 31 August 2018 The standing committee of the National People’s Congress passed an amendment to the IIT Law. 1 October 2018 Revised IIT standard personal deduction and tax rates tables apply. 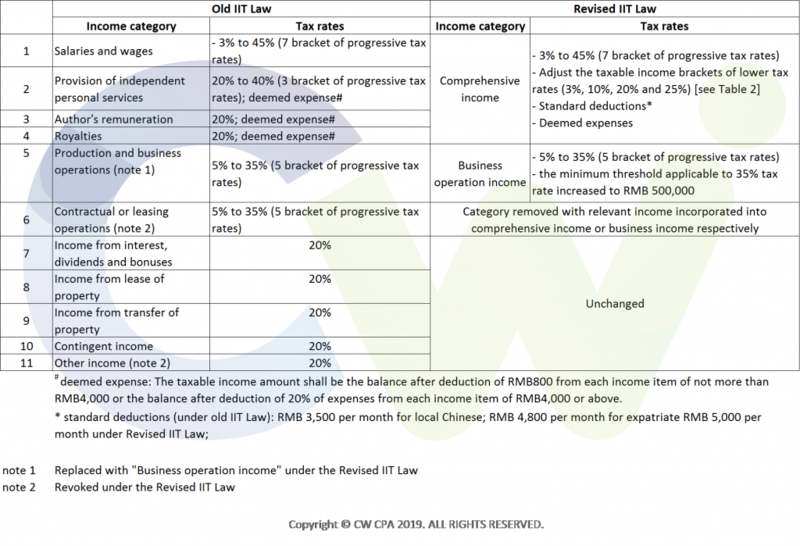 20 October 2018 The Ministry of Finance (MOF) and the State Administration of Taxation (SAT) jointly published draft implementation regulations regarding the Individual Income Tax (IIT) Law and draft rules of specific additional tax deductions (together “the draft IIT Implementation Regulations”). 22 December 2018 The IIT Implementation Regulations have been promulgated, with 6 additional specific deductions and transitional measures announced. 1 January 2019 Revised IIT Law takes full effect. This article aims at giving an overview of the major implications of the revised IIT regime. 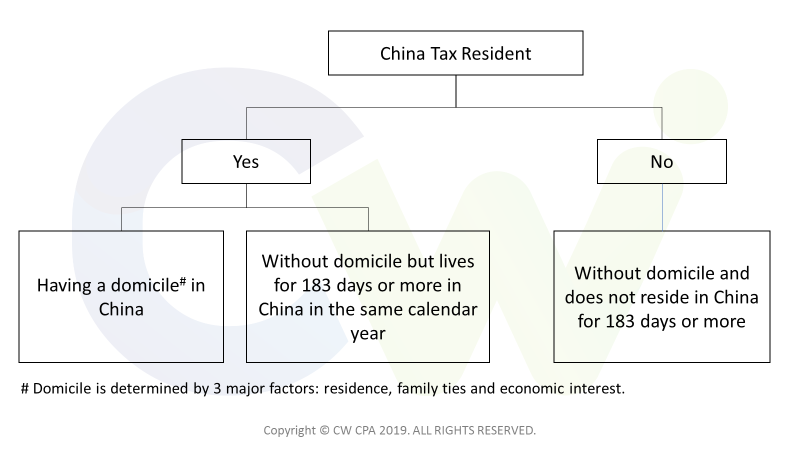 Under the Revised IIT Law, the definition of China tax resident for non-domiciled individuals has been changed from having resided in China for one full year to 183 days or more. While Article 1 of the Amended IIT Law stated that a China tax resident is subject to IIT on their global income (worldwide tax), Article 4 of the Implementation Regulations granted a concession for those without domicile in China: a non-China domiciled individuals who have lived in China for a total of 183 days or more for less than 6 consecutive years, or for 6 consecutive years but have a single departure for more than 30 days, their foreign-sourced income paid by overseas enterprise or individual is exempt from IIT, UPON filing with the tax authorities in charge. Where the non-China domiciled individuals leave China for more than 30 days in any calendar year in which they reside in China for 183 days or more cumulatively, the computation of consecutive number of years for which they reside in China for 183 days or more cumulatively shall restart. The adoption of the 6-year concession (instead of previously 5-year concession) and the tax break concept for a single trip out of China of more than 30 days that aim to ensure a stable policy and attract foreign talents have brought relief for expatriate employees working in China and their employers. As shown in Table 1, the Revised IIT Law groups 4 categories of individual income, including income from: salaries and wages, provision of independent personal services, author’s remuneration, royalties, into the scope of Comprehensive Income, which is subject to one set of progressive IIT rates. 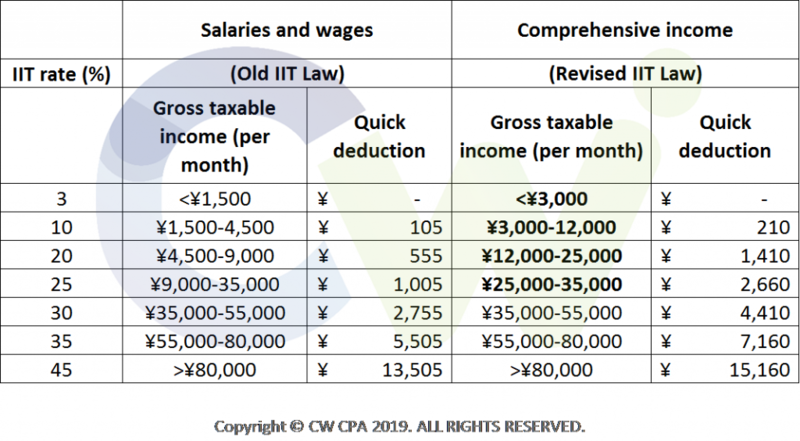 Under the Revised IIT Law, as from 1 October 2018, the tax rates for comprehensive income will be based on the tax rates applicable to salaries and wages under the Old IIT Law, with the taxable income bracket broadened at the bottom end of the progressive rate tax table, the salary amount for which are shown in BOLD font in Table 2. The taxable income bracket that has been broadened at the bottom end of the progressive rate tax table would lead to tax savings for most low to middle income tax payers, as illustrated in Table 3 below. Non-residents are still taxed on their China sourced income on a monthly basis, or on ‘as arisen’ basis, depending on the nature of income. Despite that it was mentioned in Revised IIT Law that comprehensive income will be subject to tax on an annual basis, the Implementation Regulations have clarified that withholding agents still need to use the applicable annual tax rate to calculate the annual tax liability and deduce the monthly tax payable. The withholding agents must also furnish tax withholding statements to individual tax payers for them to lodge accurate annual tax reconciliation returns. In the old days, only when a tax resident earning RMB 120,000 or more per calendar year are required to file an annual tax return. Under the Revised IIT Law, the requirement of self-declaration has been extended to more resident taxpayers[i]. Such annual tax filing is called “annual IIT reconciliation”, facilitated by a new APP developed by the State Administration of Taxation (SAT). The annual IIT reconciliation should be done from 1 March to 30 June of the following year. This entails that Chinese authorities are embracing technological advancement to strengthen the administration of tax collection. Individuals failing to file annual IIT reconciliation are subject to penalties. 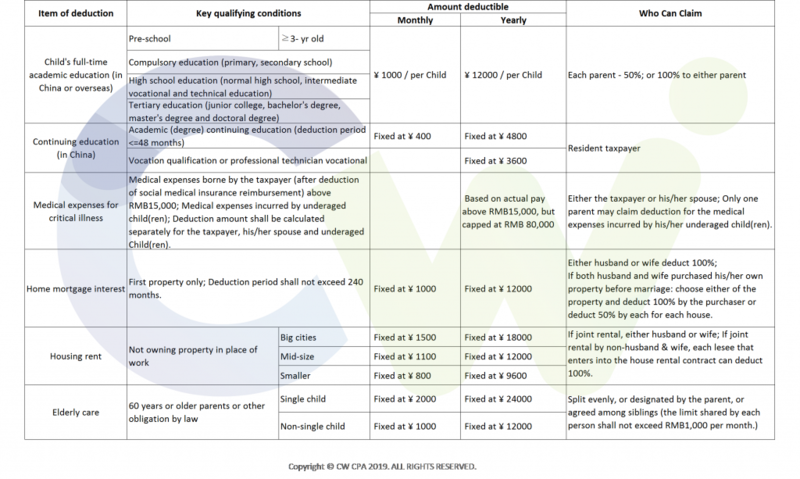 To remove the difference in tax treatment between expatriate employees and local employees, new itemized deductions for a range of personal living expenses that are for typical middle-class taxpayers have been introduced: children education, continuing education, medical expenses for critical illnesses, home mortgage interest, housing rent and elderly support (Table 4). As a transitional measure, the new itemized deductions co-exist with the 8 items of non-taxable benefits for expatriate employees under the old IIT Law that are still valid till 31 December 2021. [i] A resident individual receiving comprehensive income from two or more sources, and the total comprehensive income net of itemized deductions is above RMB 60,000; receiving independent services income, author’s remuneration and/ or royalties income net of itemized deductions above RMB 60,000; OR advanced IIT payments on comprehensive income are less than the IIT payable in the relevant tax year; applying for tax refund. During the period from 1 January 2019 to 31 December 2021, foreign individuals who are China tax residents can choose to claim the itemized deductions under the Revised IIT Law, or to continue applying tax exemption for the 8 items of non-taxable benefits for resident expatriates[i] under the old IIT Law. In addition to the carrying forward of the 8-item tax-exempt benefits for expatriate employees as an option as above-mentioned, the treatment of annual bonus, severance payment and subsidies to buy property under the old IIT Law will stay up to 31 December 2021 as transitional measures. Taxpayers should analyze to see whether the transitional measures can result in lower tax burden. For High net worth individuals whose major incomes tend to be from dividends and income from transferring assets. Despite that the Revised IIT Law does not change the IIT treatment of these income categories, the newly introduced IIT general anti-avoidance rule (GAAR) would impact them significantly. This is especially so with the commencement of the automatic exchange of financial information (AEOI) under OECD’s common reporting standard (CRS). The total number of exchange relationships activated in relation thereto covers more than 80 countries and jurisdictions. These together with the adoption of big data technology under Golden Tax Phase III that have resulted in multi-sectoral collaboration and information exchange[ii], the China tax authorities would raise queries more frequently on how offshore assets beneficially owned by Chinese tax residents were acquired, the source of funds and if any income or gains generated therefrom are properly taxed in China. With the powerful tools above-mentioned, together with the requirements for “put-on-record” filing requirement for claiming concessions, we perceive that domicile would come under greater scrutiny, especially for those employed under dual contract arrangements and frequent business travelers. Under the Revised IIT Law, where a tax resident individual provides information related to itemized deductions to the employer as the withholding agent, the employer is required to take these deductions into account in calculating tax withheld. The duty of care has shifted more to taxpayers (the employees) who are responsible for any error and can opt not to give the information to the employer. However, to minimize the risk of errors made by employees, it is advisable to have employees signed to confirm the amount of deduction and to remind taxpayer’s duty of care. manage expectations of the employees. For any enquiries, please write to Delilah Li delilah.li@cwhkcpa.com. The information contained above was assembled on 25 January 2019 based on the laws, rules and regulations available at that time. Please contact us to ensure that you have the most updated information. The information contained in this presentation does not constitute the rendering of legal, tax or other professional advice or service by CW. CW has no obligation to update the information as laws and practices change. The application and impact of laws can vary widely based on the specific facts involves. [iii] See our article dated 31 July 2017 “Big data revolution in taxation – how big data changes China’s tax collection system“.